I remember that some of the Angela Thirkell group members tempted us to read Georgettte Heyer's mysteries and this one was kept for Christmas time. 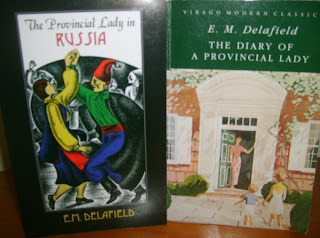 We all discovered the murderer well before the incestigators but we all enjoyed the book and, generally speaking, the mysteries better than the romances. I agree with you about the British Library Crime Classics: their lovely covers are a great asset to their publishing and sales! Why not? This is so pleasant to handle a nice book. Yes, I think the BLCCs have proved that a well-produced, attractive book is still something to be coveted. I believe the paperback sales of some of their titles have outstripped the eBook versions. I was recently touring an exhibit on the Hapsburg Empire with some fellow Heyer readers, and we all stopped in front of one painting (and its label) and said, "Envious Casca!" When I first read this, I didn't know enough about them to spot the major clue. I do like Mathilda! Paula and her playwright crack me up every time. She does write beautiful social comedy, whatever the period, doesn't she? This is the only one which I haven't tracked down, I've read all the others, I'm glad you enjoyed it. I love that cover too. I'm sure I read all the Heyer mysteries when I was a teenager but that's so long ago that I don't remember anything about them. It was like reading a new mystery! I haven't read any Georgette Heyer for ages, but this sounds lovely. I must see if I can track down a copy in time for Christmas. The BLCC covers are lovely, and, quite unusually, I've been able to see them in real life before buying as W H Smith has a display unit full of them. I'm hoping they sell lots of them, and it encourages them to take a chance on some more small/specialist presses. Yes, the more small publishers are promoted in bookshops, the better. It's another reason why we need bookshops. Online is great when you know what you want but it doesn't always give you that discoverability that you get in a good bookshop. Envious Casca is one of my favourite Heyers and favourite mysteries. I reread it faithfully every Christmas because I love the interaction between the characters, and the wry comments that get tossed around. When my old paperback copy (with tiny tiny print) finally fell apart, I bought a lovely old hardback with dust jacket to replace it. Hmmm, reissuing it under a different title. I suspect a LOT of Heyer fans might turn to murderous thoughts when they acquire it and find out the truth. The Amazon listing prominently mentions that ACP was also EC but I don't know how obvious it is on the actual book. Was just thinking about re reading this as well, I got very excited when I saw the new cover, briefly thinking it might be a new (to me) book. Sadly not the case but it's a while since I read any of her detective novels and I remember them being fun. I'd like to reread her other detective novels too. I tried the audio book version of EC but didn't like the narrator & she narrates all the audio books so I'll be reading rather than listening to them. You know, Lyn, it's a funny thing. I read this a while back but I simply cannot remember anything about it. Your review brought back a glimmer (well, there are MANY books with this sort of plot so that's not saying much - ha!) which makes me want to find the book on my shelves and give another reread. 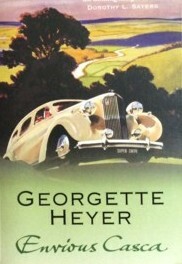 I think the first time around I wasn't that crazy about it though in general, I love Georgette Heyer and just about anything she does, including her mysteries. Which, by the way, are a delight to listen to on audio. I read all the Heyer mysteries many years ago so they're like brand new books after this distance in time. I think the mysteries have been a little neglected so it would be good to read them again.